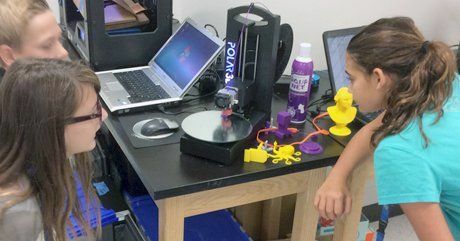 In part five of his year-long series, Kevin Jarrett highlights the tools and systems that drive the excitement and invention in his middle school makerspace. "It's not about the tool," they say -- but sometimes it is. In our middle school makerspace, students have been using a variety of tools and technologies in a variety of projects and activities. And there are many more that we've yet to explore and experience. 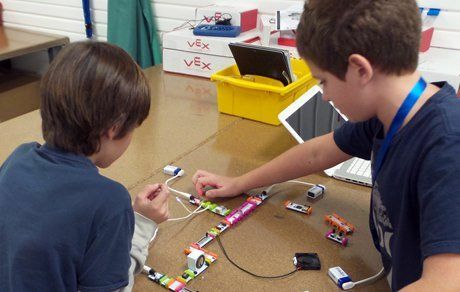 While our makerspace is still in its infancy, it feels like we've had the program forever. As of this writing, a second group of students is in the midst of Design Experience One. We haven't had that much time to delve into projects in depth, but you can expect more from us later in the year. Before I go any further, let me say that we realize just how fortunate we are. We have resources that many schools can only dream about (but with a great crowdfunding initiative, that needn't be the case). Northfield is a small town of just under 9,000 people, and a single-building K-8 district. Our per-pupil costs ($16,292 in 2014) are consistently less than New Jersey's state average ($18,891 in 2014). We have extremely supportive community organizations that fundraise tirelessly for us. We, in turn, work hard to wisely design innovative educational experiences for our kids. Makerspaces are too often defined by things -- hardware, software, other technologies -- which can engender a shopping-list mentality among people interested in creating such a learning environment. 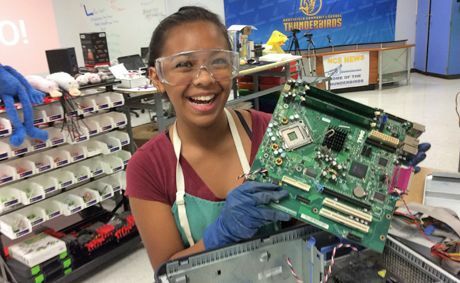 A true makerspace is defined not by what's in it but rather by what comes out of it: projects, experiences, artifacts, and learning. The tools are just a means to an end. With that proviso, here are the 20 most important tools being used in our space right now. We want students to collaborate effortlessly, express themselves freely, and do so in ways not possible in other classrooms. 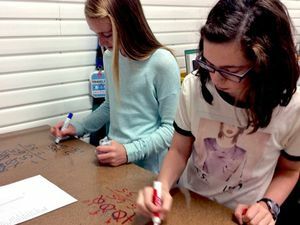 We painted several walls in our space with clear dry-erase paint, but more importantly, we painted the work tables with it, too. This is by far the most powerful and popular feature in our Digital Shop. Kids love the freedom that comes with writing on the tables with dry-erase markers. It's fun, fast, easy to clean up, inexpensive, and a winner! We also have this fantastic paint on two wall spaces. Check out this hyperlapse video shot by a student! Yes, that crafting essential has found its way into our space, and it's probably the second-most popular tool so far. Why? Hot glue does amazing things. 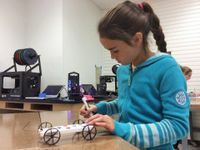 It binds dissimilar materials with ease and strength, allowing students to quickly create amazingly detailed prototypes. Cleanup is a snap, and the glue is easily removed, making most parts easily recyclable for other projects. The guns are inexpensive and allow us to talk about and practice tool safety. Digital Shop is a technology class at its core, so computing technologies are crucial. Google Chromebooks and Google Apps for Education are our go-to for collaborative projects, presentations, writing, research, and most forms of digital creation. We have 12 Chromebooks for students to use and share. Sometimes, we need software that doesn't run on Chromebooks. When Mrs. Stephanie Terista, our seventh-grade ELA teacher, brought her students in to create 3D dioramas for the book Bud, Not Buddy, she had them use our Dell laptops and the free Sketchup Make program. We have 12 PC laptops for students to use and share. Students learn sketching skills in my program, because sketches help them understand how things work and fit together. With sketches, they brainstorm ideas and document their work. We started the school year with quadrille-ruled pads but have since purchased and given every student quadrille-ruled composition books, which they'll use as design journals for the entire school year. We were very fortunate that our PTO funded a littleBits Pro Library, a massive collection of sophisticated, LEGO-like electronic blocks that snap together, allowing creative minds to bring ideas to life. When combined with found materials like cardboard, the only limit is the kids' imagination. Before talking about our 3D printers, I want to emphasize that 3D design is the crucial part -- 3D printers don't make kids into engineers any more than laser printers makes them into writers. It’s not about the tool, it's about what you do with it. We love Tinkercad. It's free, fabulous, and easy to use. We also love the lessons in Autodesk's Project Ignite, which is based on Tinkercad and is also free. Today, students can hold in their hands a design that they imagined in their mind, a capability that didn’t exist until recently. Once kids have designed objects in Tinkercad, they can use one of our three printers -- by Makerbot, Polar 3D, and Lulzbot -- to render it. My program is only just getting started with 3D printing, as we've been focusing on design thinking concepts and other related projects. But some kids have used the 3D printer to design components for those projects. Ready, Set, Design is a fabulous 45-minute activity that teaches students what it's like to do authentic design via rapid prototyping. It's free, fun, and suitable for learners of all ages. This imaginative, inexpensive kit is a massive collection of colorful character cards, design challenges, and other resources providing a fantastic introduction to design thinking. Kids are challenged to create solutions that solve problems for these characters using traditional crafting supplies. 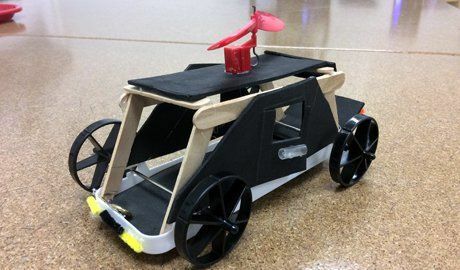 Their detailed prototypes are whimsical, imaginative, and just plain fun. Nothing says rapid prototyping like easily manipulated materials formed into impressive, well thought out, even partially functional models of ideas brought to life. You can't go wrong with simple items like pipe cleaners, felt, foam, and craft sticks. 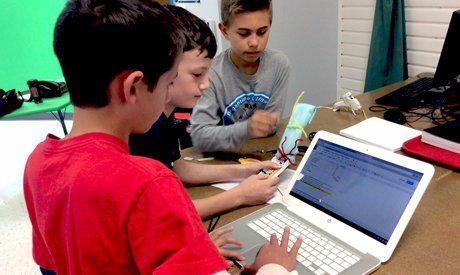 Students love Scratch and Tickle, which they use for a variety of purposes, from creating book-based video games with Raspberry Pi to commanding our drone armies. We have a Parrot Rolling Spider, a Sphero, an Ollie, and two sets of Dash and Dot Wonder Robots. To be honest, we haven't done much formal learning with them because it’s still early in the school year. However, that doesn't stop kids from constantly picking them up and playing with them. Our intent is challenging the kids to program them instead of just flying or driving them. We'll be reinforcing that need for algorithmic skills and knowledge soon. As mentioned above, we're working on using Raspberry Pi to create book-based video games. Despite our best efforts, though, the Pi cannot run Scratch 2.0, so our programs need to be written in Scratch 1.4. That said, we do love this Raspberry Pi Starter Kit. We only have two Airs (three, counting my personal iPad) but they've been invaluable for multimedia content creation with iMovie, photography, and green-screening (we prefer the Touchast app). These shop aprons were $0.50 each at a local industrial surplus store. The goggles were $0.99 (though they aren't anti-fog and tend to cloud up on warmer days). They're functional and evoke the “shop” vibe that we're going for, and kids love wearing them. I wanted LEGOs for my classroom but was apprehensive about making such a costly purchase. Instead, I asked for donations and scored big time. One family donated 30 pounds of LEGOs, which we use in projects and also when we have extra time for a five-minute LEGO design challenge. Design Experience Zero, students' first exposure to my program, incorporated a "take-apart" element. We want our kids to learn proper use of simple hand tools, and the results have been fantastic. "Take-apart" has been the single most popular activity that we've had so far. While our versatile walls aren't a tool per se, they're important to the function and style of the makerspace. Slatwall panels add much-needed storage capability and look fantastic. Inspired by the PBS documentary If You Build It, I wanted our program "mantra" proudly displayed on our wall in giant, colorful lettering. Application was a snap (thanks to dedicated parent volunteer Mrs. Monica Keenan). The letters form the basis of the "threshold experience" as the first thing people see when entering the room. So there you have it, Digital Shop's Top 20 tools and resources. There are others that we didn’t include only because we haven’t had time to use them yet. 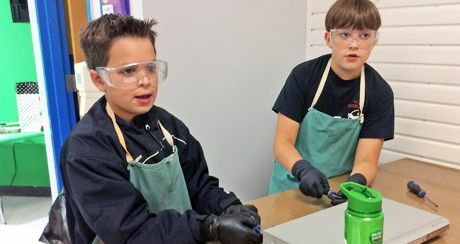 Next month, we’ll focus on a more detailed review of what’s going well in our middle school makerspace -- and what could improve -- as we head into winter recess. Thanks for reading!